Our idea of going to Santorini was, of course, because I really wanted to go there since forever, also to have some relaxing days to rest a bit from our busy holidays in Europe. We got 4 days there, but in case you just want to check the main spots on the island, I would say 2-3 days are enough. Something that I feel I must say is that I was a bit disappointed. Look, the place is beautiful indeed, but the photo perfect areas with those cave houses are super touristic. When I travel I like to see how the locals live, and there I had the impression I was in a theme park. All those houses are rentals, shops, restaurants, or hotel for tourists. The locals live on the further areas of the island in very normal houses. 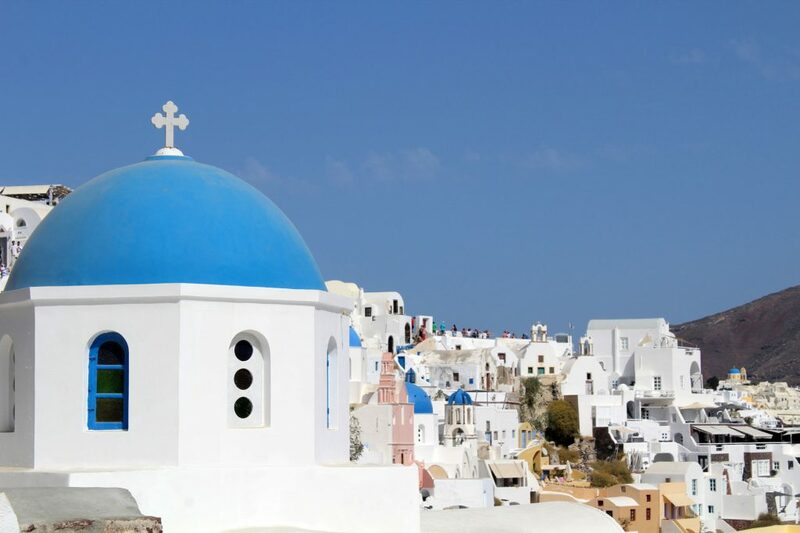 I saw just one or two suburbs with that architecture you imagine when you think about Santorini. Putting it aside, the place gives you a lot of options to just chill and refresh yourself under the burning sun of Greece. Anyways, I had 4 amazing days there, which I’ll be happily sharing with you now. If you want to get straight to the point, here you can get my Google Maps with all the main attractions conveniently marked for you. Keep reading if you would also like an overview of these attractions. 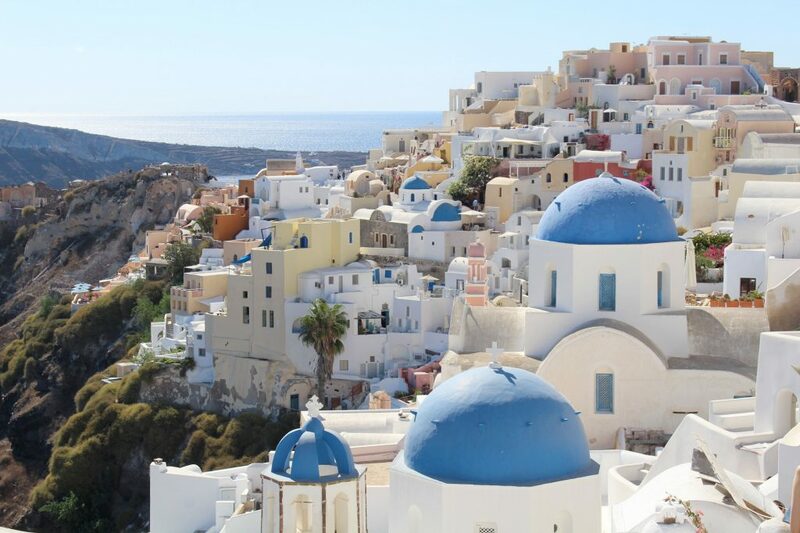 Take your time to stroll around these three suburbs in Santorini. Going up and down the alleys, there you will find those beautiful and white cave houses, a few shops, and restaurants, all facing the super blue Mediterranean sea. Really good food and service in the middle of Thera. 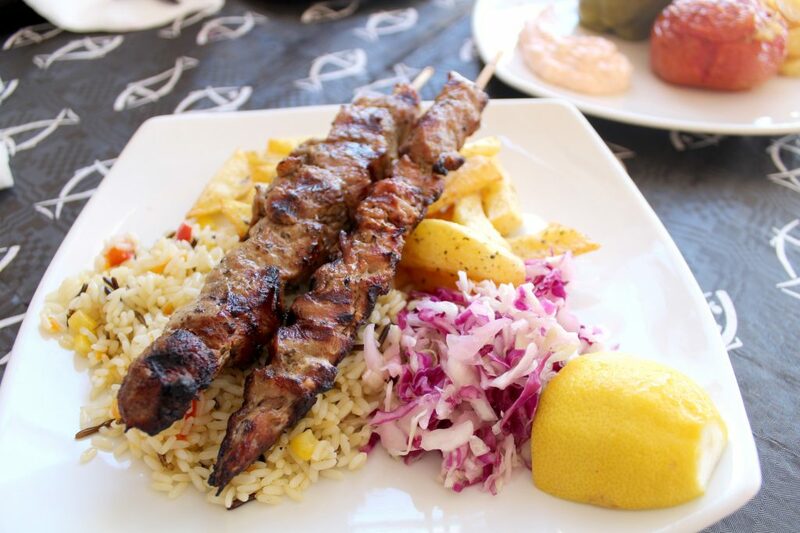 Pork souvlaki with pita bread and tzatziki sauce. Good option to have a break and refresh yourself. Amazing dining experience and food with superb views. 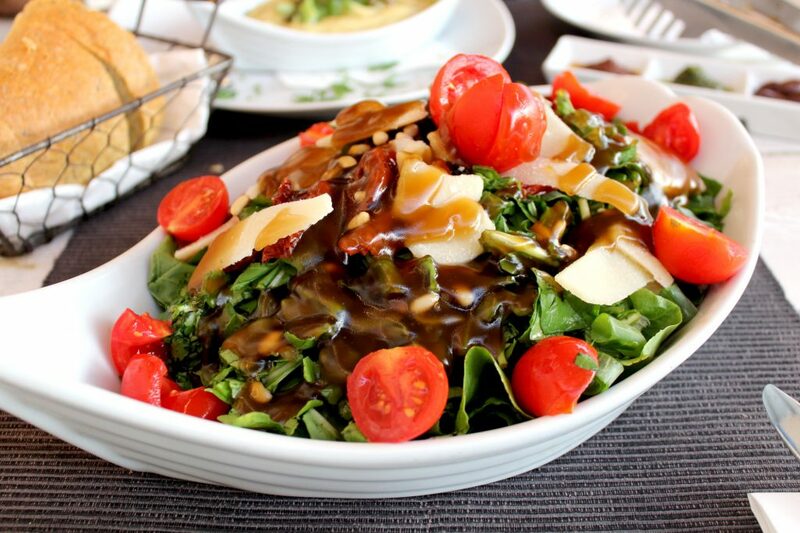 Santorini salad – lettuce, rucola, raisins, fresh onion, sun-dried tomatoes, pine seeds, parmegiano cheese, and special honey dressing. 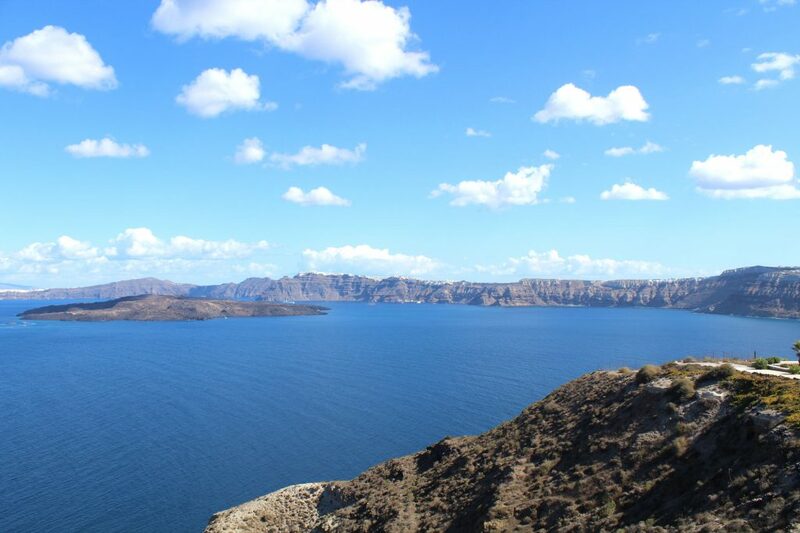 In case you like a hike, the one from Thera to Oia is amazing! You will get the front seat to gorgeous views of the island and the Mediterranean sea, plus some good legs workout. Yes, this hike has lots of ups and downs, so be prepared! The hike took us a total of 4 hours. We left Thera around 8 am and arrived in Oia at lunchtime. I also suggest a few stops along the way: Agios Georgios Church, Skaros Rock, Church of San Antonio Ekklisia Profitis Ilias. Bring water and food as you will walk through some long areas without shops. If you still have energy, take your time to explore Oia in the afternoon. Or do like us, we went back to our hotel to rest and took a bus to Oia late in the day so we could watch the sunset from there. 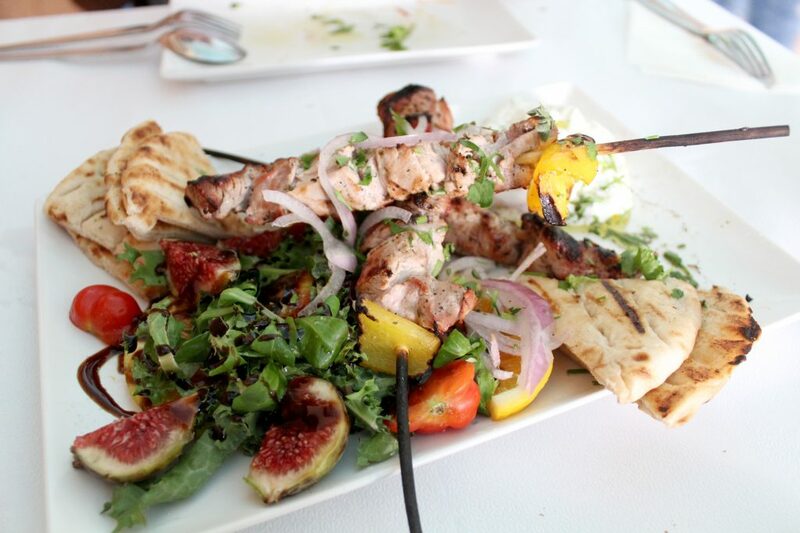 Outstanding ocean views and great food! 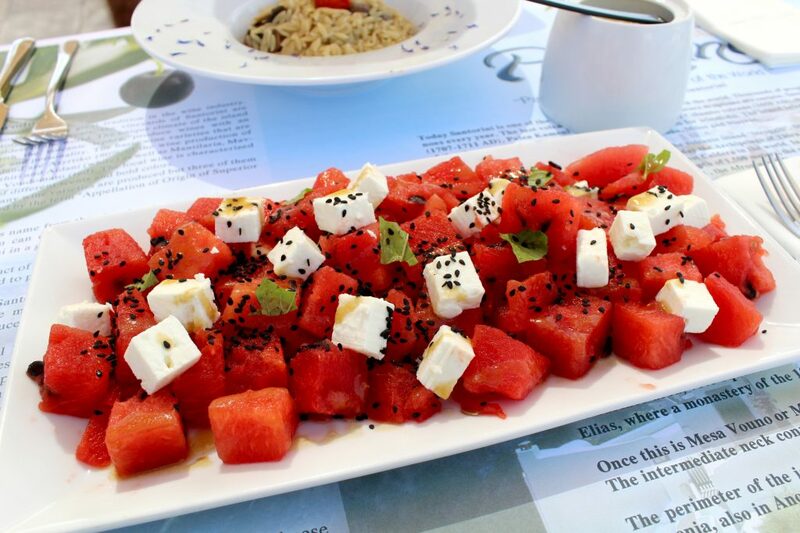 Water melon salad – watermelon cubes and arugula, with feta cheese and fresh mint leaves, sprinkled with grapes syrup and rosewater. 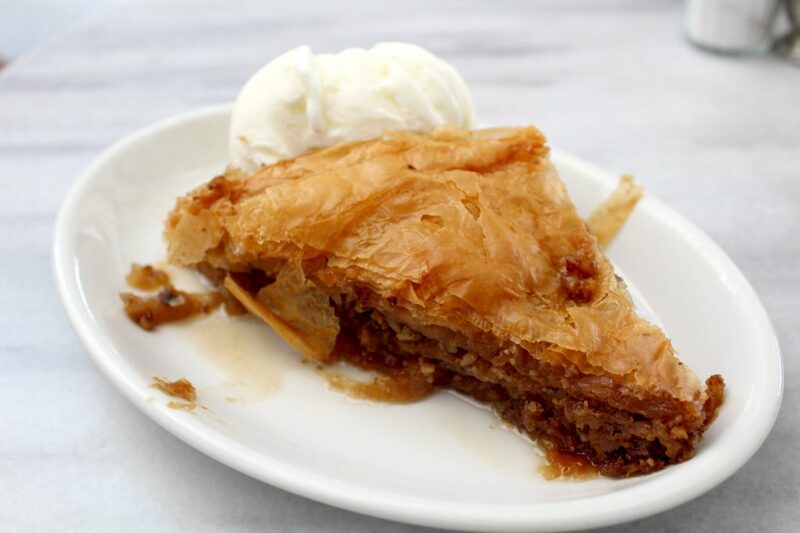 Good baklava with homemade ice cream. Baklava – layers of filo pastry, filled with chopped nuts and syrup. 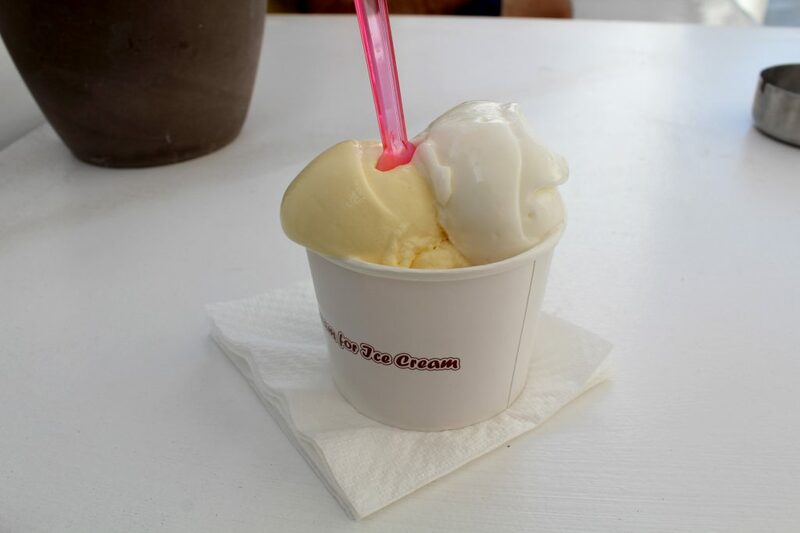 Served with vanilla ice cream. 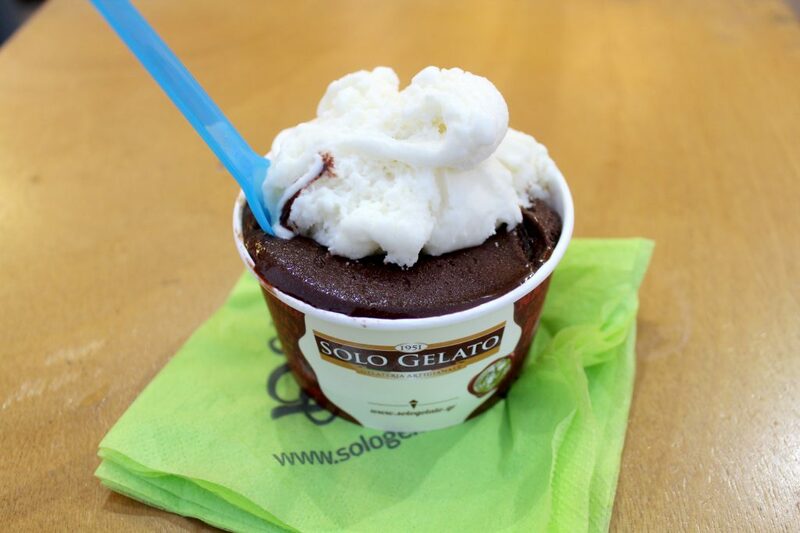 Very good gelato in Oia. This black sand beach is perfect for a relaxing time. We got a couple of chairs available from one of the restaurants and spent the morning just chilling and having some sangria. In my opinion, this is the most beautiful beach on the island. This is another good option for the combo beach + drinks. Good restaurant option at Perissa beach. Top notch restaurant in Thera with delicious food, huge portions, and good prices. 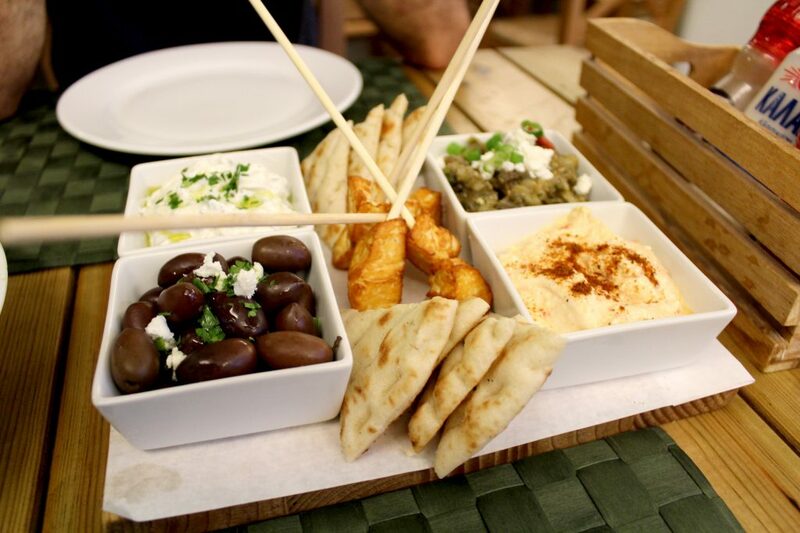 Chef’s mezze board – Tzatziki, roasted eggplant dip, chilly feta cheese dip, marinated olives and feta, haloumi skewers, and grilled pita bread. In case you rented a car or an ATV, take a day or just half a day to explore this part of the island. Beautiful views guaranteed! 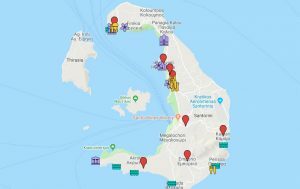 I suggest you stop by Paralia Vlichada, Red Beach, Black Beach, and Akrotiri Lighthouse. Very good food that reminds me of something made by a mother or grandmother. Worth a try. 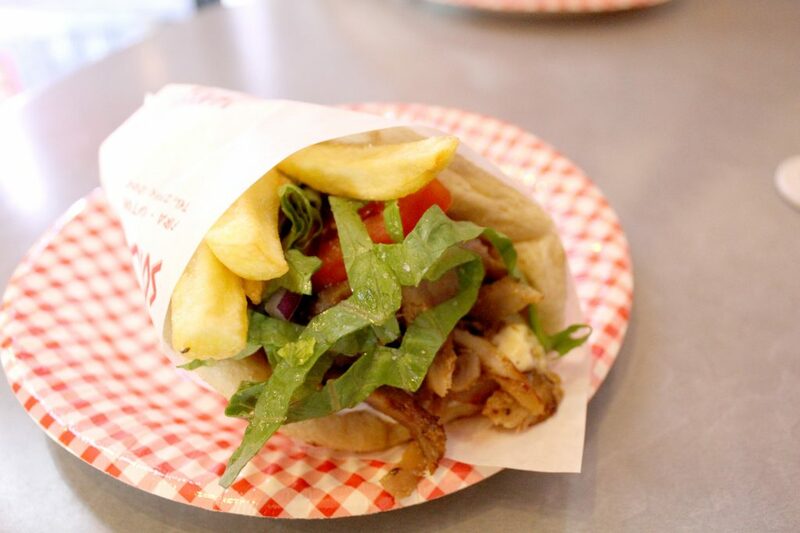 The famous gyro that’s not so great. 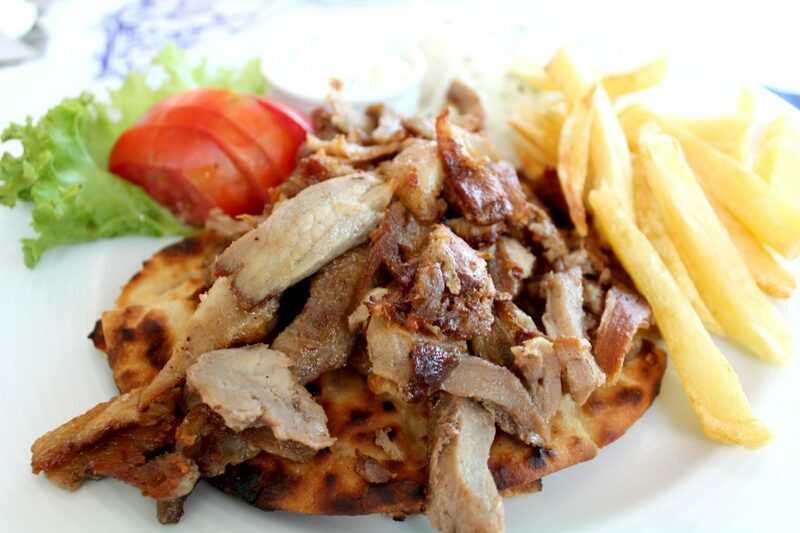 Pork gyro – served with hot chips, tomatoes, lettuce, onions, and tzatziki sauce. Very good gyro in Thera. 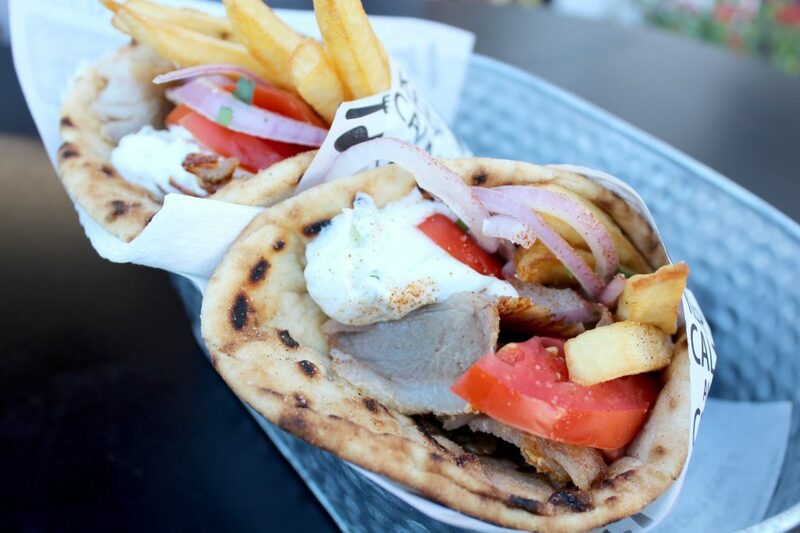 Pork gyro – served with hot chips, onion, tomatoes, and tzatziki sauce. You can check more posts here on the blog about my holidays in Europe and also everything I published about Greece.